This lovely lighthouse decor is stunning throughout your home. A figurine or wall decor at work will show your love of everything nautical, too. A lighthouse is the perfect example of something you will find on the coast. They are there to guide ships through the fog, and they are gorgeous! Lighthouses were built in a variety of sizes, styles, and colors, and we think each and every one is special! Here you will find all types of lighthouse decor. Lighthouses for your bathroom, kitchen, living room, bedroom, and any other spaces in your home. Lighthouse decor will add a distinguished look to any room in your home. Place a figurine on a bookcase, pretty wall decor over your sofa or bed, a shower curtain in your bathroom, and so on. Imagine waves crashing on the coast as the majestic lighthouse stands firm through it all. The people who work in there are dedicated to everyone’s safety and well being. What a life! Below are some lighthouse decor options for your home or office. Bring some light into your home with this lovely lighthouse decor! Shower curtains, vanity items, bath towels & rugs, and more, all with a nautical theme, will bring pretty design into any bathroom in your home. Lighthouses add interest, color and beauty to your space. You spend a lot of time in your bathrooms, so make them appealing, welcoming and a happy place to be. Bring a touch of the sea into your bedroom with this lighthouse bedding and other lighthouse bedroom decor. It’s a fun way to add interest and design to your room, and it’s ideal for any gender. New bedding gives your bedroom an entirely new look and feel. Relax in a coastal themed bedroom with this pretty lighthouse bedding and other bedroom decor. Spruce up your kitchen and dining room with this lovely lighthouse decor. 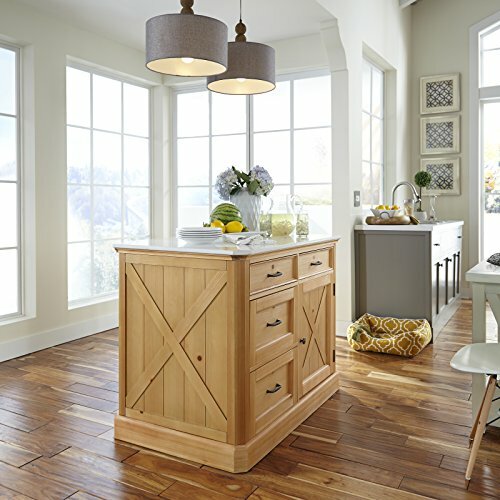 From dinnerware to other decor, you’ll enjoy entertaining guests and spending time with family in your nautical themed kitchen and dining room. Lighthouse wall decor can be used throughout your home to add lovely details, pops of color, and interesting topics. Lighthouses are the perfect choice for any coastal living decor, seaside decor, beach house interiors, etc. Wall decor completes the look of any space. Coastal cottage decorating is really quite simple. Think beach house interiors, seaside decor, nautical themes, etc. White furniture goes well in any coastal design, as does wicker and bamboo. Consider wall decor, area rugs, table and floor lamps, figurines, candle holders, and any other items with a nautical theme or coastal flare. You can go big and create an entire coastal theme in one or more rooms of your cottage, or simply add a few items here and there such as a few figurines, a coastal canvas wall print, etc. Keep DVDs, CDs, and more, organized and clean in this gorgeous coastal console cabinet. Great to set a stereo on, or a TV. 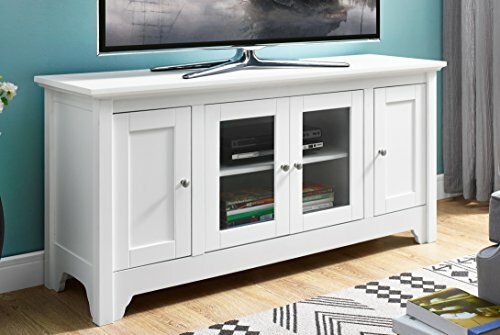 Built to support TVs up to 55 inches, this wood media console is the perfect solution for your home Entertainment. Features four media cabinets with adjustable shelving and a built in cable management system to fit your components. Crafted from high-grade MDF with wood veneer finish to fit your home décor. Nantucket furniture is often times white, but it certainly doesn’t have to be. Look at the color options below, and you’ll notice how attractive each item truly is. Match furniture in any room for a cohesive look and feel. Signature solid pine “X” frames defines this classic country design, utilizing multi-materials to capture the look and the feel of a rustic country item. Delivered to your door by parcel post service; meaning no waiting for lengthy truck delivery. Wire brushed inset wainscot pine veneer panels, with wire brushed solid pine frames, providing a unique textured surface to all areas, and then combined with a multi-step natural honey pine finish. The engineered quartz top in a white marble finish provides a large work surface that covers the kneehole recessed area that provides ample room for the matching stools. Canted corner design adds a soft feel to the top and the corners. 4 large storage drawers, with 1 door, which opens to 2 adjustable shelves. Industrial designed drawer pulls in antiqued nickel finish. Note finish and measurements may vary slightly. Assembly required. W-47”, D-30”, H-36”. Pretty blues and greens adorn this decor, and they make lovely additions to any beach cottage or coastal design. You’ll enjoy adding these pops of color throughout your home. The faint scent of Lavender will greet your guests and the beauty of real Sand Dollars and Starfish will send a coastal welcome from your beach side retreat. Lavender sprigs are hand woven together with dried Bear Grass Twists, Echinops, Dark Blue Larkspur, Pearly Everlasting, and Green Millet. The wreath is available in a standard 22″ diameter, suitable for most doors. Made in USA. 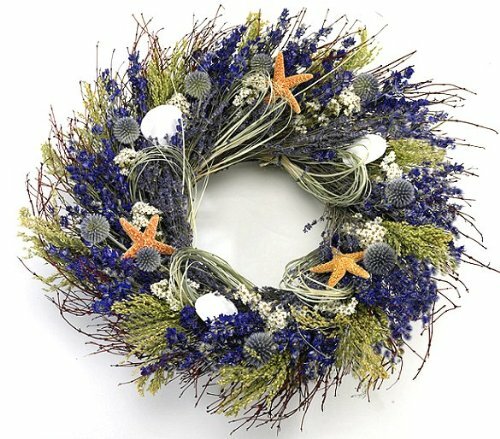 The Lavender Isles Coastal Wreath also makes a beautiful beach theme wedding centerpiece. Add your own hurricane full of seashells or a cylinder candle, to complete the beach theme. Preserved wreaths last longest when placed indoors or in a sheltered outdoor location, as humidity and direct sunlight can cause fading. Wall decor is a nice way to add interest, color and design themes to any room in your coastal cottage. Consider wreathes, framed art, canvas prints, metal wall decor, clocks, etc. Your coastal home decor should definitely include coastal living room furniture. While the coastal living furniture featured here is for your living room, you can use many of the pieces in other rooms throughout your home, too. Whether you place one coastal piece in various rooms, or you do a complete coastal furniture theme is up to you. Coastal furniture often includes bamboo, wicker, white furniture, etc. However you can add tropical touches to any furniture with throw pillows and throw blankets, too. Your living furniture should include comfortable seating options, side tables, a coffee table (if you have room for one), lamps (floor or table, or a combination), and some decorative items of your choice. If you have room, you might also consider a sofa table, a bookcase, wall shelves, etc. Below are some choices we love for your coastal living room furniture! Just about every room in your home needs a table or two. From bedside tables to coffee tables, and foyer tables to sofa tables. These tables featured below all have a nautical or coastal feel to them, and they will go well with your nautical home decor! You’ll find many coastal tables below that are perfect for your coastal living room and more. Sofas, chairs, TV stands, etc. Your living room needs them all in order to be the ideal place for family and guests. Make your living room an inviting and relaxing place to soothe away your cares and entertain your guests with this lovely coastal living room furniture. Furniture accents such as table lamps, wall decor, mirrors, figurines, and more, put the finishing touches on your coastal living room. You’ll enjoy mixing and matching designs and colors to create your very own nautical atmosphere!